We met Kirsty and Freddy in Iran in 2014 and are friends since then. 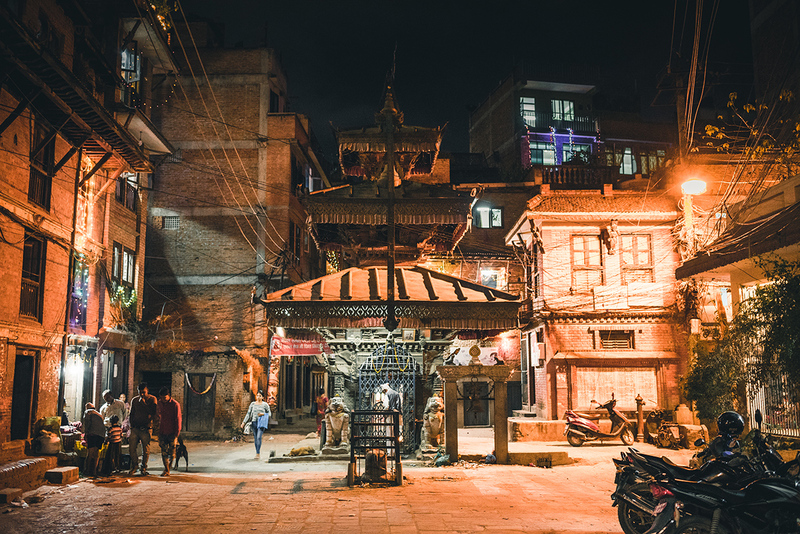 Some months before our trip a Couchsurfer recommended staying in much more quiet Patan instead of Kathmandu so this is what we did. For 3 nights we stayed in a lovely family-run guesthouse. The weekend we arrived was "Diwali festival of lights" where people colorfully decorate the entrances of their homes and also go to visit their families. 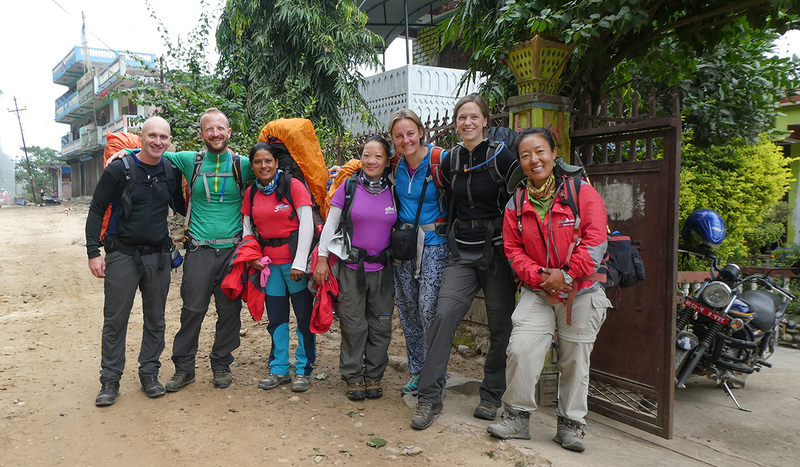 We still needed to pay for the trek and get the money needed for food and accommodation during the trek. Because of the festival many ATMs were empty or only gave us a very low amount of money. So we needed to dedicate one whole morning to get a lot of Nepalese Rupies. After taking two local transport (one of them being an E-TukTuk) we finally arrived at a bank (thank you Standard Charted!!) where we managed to get enough money for the four of us. Finally we left for our trekking adventure. From one of the countless bus stations we got on a local bus from Kathmandu to Arughat. After one hour driving out of the city… we had a flat tire ;-) After a 1 hour break at the dusty mechanics next to the road the bus was good to go and after another 7 hours we arrived at our final destination. There we met our guide Dawa and our two assistants Laxmie and Kalpana for the first time and from the very first moment we could tell that we would have an excellent time with these 3 lovely women. The next day we left for our 12-day-trek. 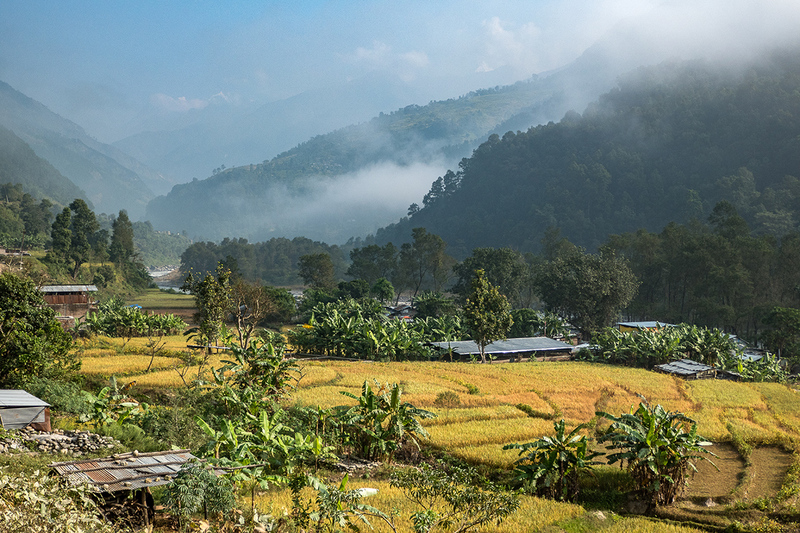 We started in lush green jungle with rice fields and countless beautiful waterfalls. This was not exactly what we expected to see in Nepal. 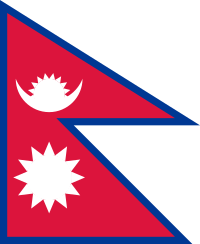 Because Nepal is much closer to the equator the climate is very different to ours. After 3 hours of walking we reached the very end of the road. From now on there was only a small path along the valley. We were very lucky with the weather - we had no rain at all and only clouds in the afternoons. It was harvesting time during our time in Nepal. At lower altitudes they harvested bananas and rice. At higher altitudes they harvested wheat and millet, carrots, cabbage and apples. We normally got up at 6:00am when the sun was rising. Then we packed everything and had breakfast from 6:30 to 7:00. Around 7:30 we left our accommodation and started hiking. We walked along the river, passed some small villages, went up and down a lot and crossed the river on hanging bridges a couple of times. After 3-4 hours we made a lunch break. This usually took more than an hour because everything you order is cooked fresh. After lunch we normally continued walking for 2-4 hours before we arrived at our accommodation for the day. Most times we had two-bed rooms - just twice we had four-bed rooms. At some places there was a warmish shower but mostly it was buckets with very cold water for (basic) washing. We had one set of clothes for hiking and in the evening we wore our second, non-smelly set of clothes. Every once in a while we did some washing. Electricity was available at some places and once we got higher you had to pay to charge your batteries. After arranging the stuff in our room we mostly sat in the common room where we drank A LOT of tea and played Yahtzee (German: Kniffel) until it was time for dinner. Because the sun set around 6pm and evenings were cold we mostly went to bed around 8:30pm. After the first 3 days of hiking the temperature started to get more moderate and suitable for us (not for Kirsty - she really embraces the heat ;-). 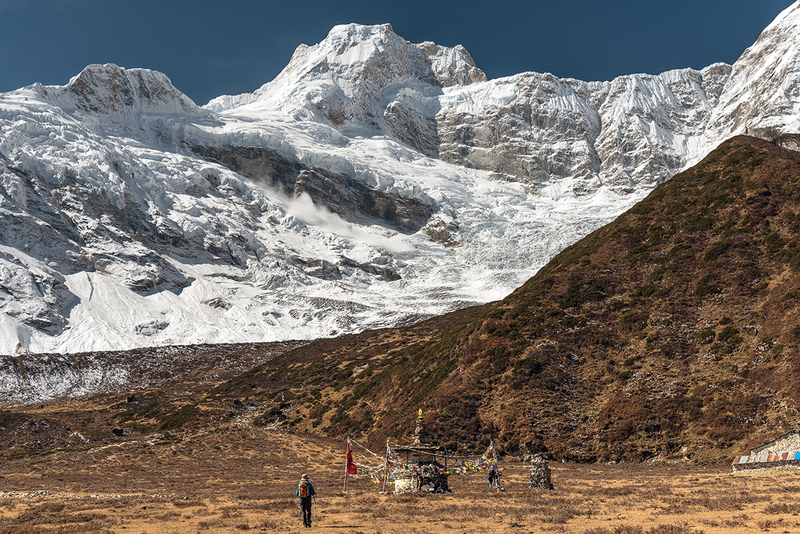 The most beautiful part of the trek was the part from Namrung to Lho were we got the first proper view of the white snowy mountains and the glaciers. 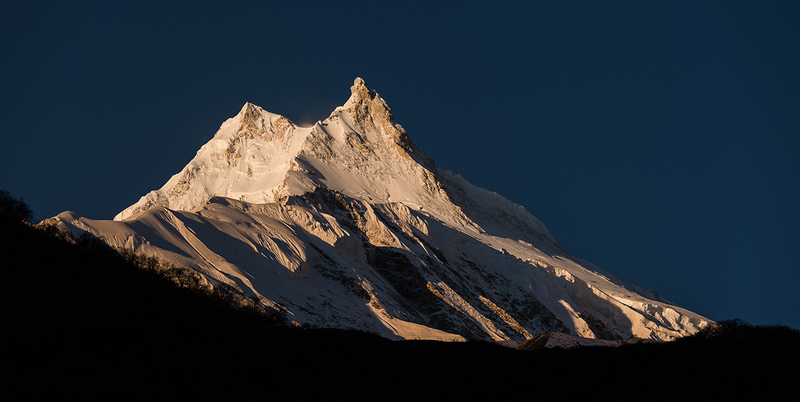 The first sunrise in Lho, were we could see Mount Manaslu, was amazing. Every day we had to let pass a lots of mules which carried supplies to all the villages. At higher altitudes we saw a lot of Yaks. 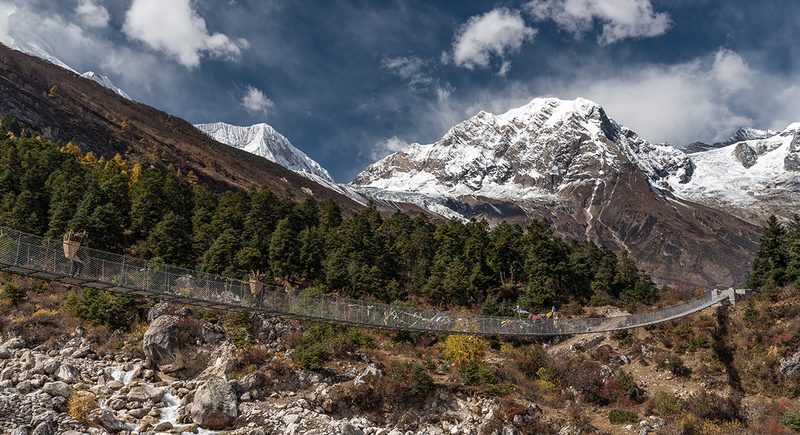 During our trek we walked approximately 190km, went up and down nearly 15.000 height meters. When we arrived in Pokhara we cursed ourselves for booking a guesthouse on the edge of the city on a hill :-) But in the end this turned out to be the perfect place for us because after being in the nature for 12 days we were not ready for a busy, touristy city yet. Before we had to go back to Kathmandu we did a one day stop in between in Bandipur. 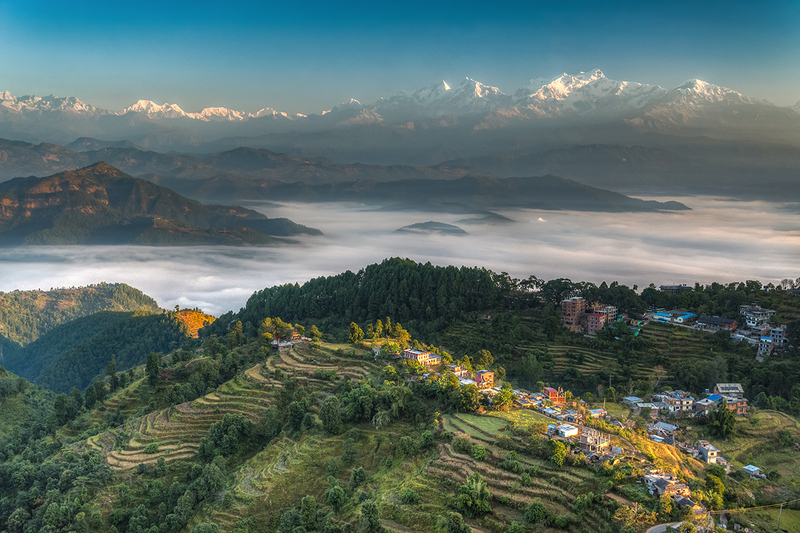 Bandipur is a nice, quiet, little village in the hilly mountains. There was a perfect viewpoint close-by for sunset and sunrise with a very nice view northwards to the high mountains of Annapurna, Manaslu, Ganesh and Langtang. On our last day we spontaneously decided that we still have some time to visit the "monkey temple" and also the touristy center in Kathmandu. In the evening we were sad to say goodbye to our dear friends and left to our hotel next to the airport. The location was excellent and the next morning we were able to walk to the airport. we have travelled quite a bit so far but in Nepal we were at our first restaurant ever that run out of rice.